Bike riding is becoming increasingly popular due to advancements in gearing, braking, comfort, and handling. More people are riding as a commute both to school and work. Road bikes have become faster and made out of new lightweight materials. The design of the frame, cables, seating, and handlebars have all improved. The best road bikes have increased in both strength and comfort. Many cities have installed special bike paths for a faster commute. Riding a bike as a main mode of transportation saves fuel, insurance cost, and is much healthier. The quality of road bikes continues to improve with the increase in technology and computer design. 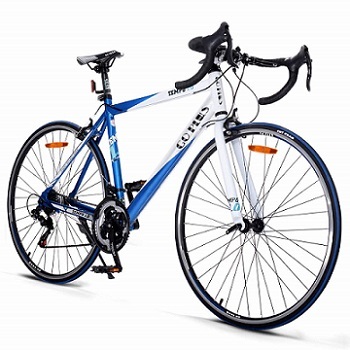 There are cheap road bikes available that are still of good quality. 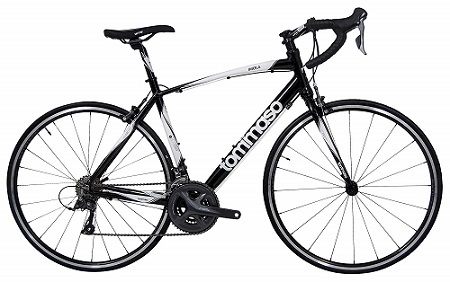 Tommaso Imola Endurance is an awesome road bike that you can find for under $600. It features an aluminum frame with added magnesium that is super lightweight, Shimano gearing, and lightweight wheels. The handlebars are very easy to adjust that makes a comfortable ride for people of different heights. To help avoid wrist strain, the handlebars are designed flat on top with the brake levers easily accessible. The Imola uses Shimano Claris derailleurs and shifters for precision shifting through the gears, both up and down through the derailleurs. It features 24-speed gearing which will make sure you have the right gear no matter what the terrain is like. You will quickly get up to road speeds with efficient shifting. With a high-speed road bike, you will also need to be able to stop quickly. The brake calipers are a dual pivot design which is also made by Shimano Claris. They will bring this bike to a fast stop in all types of weather. The bike gives an ultra smooth ride thanks to the aluminum frame that absorbs a lot of impact from irregular roads and surfaces. It also features a tube type aluminum fork with Steel Steer technology which also helps absorb road impact. The Imola is also equipped with road bike tires that are 700 c by 25 mm, which also combines to the smoothness of the ride and increases handling. The bike offers 5 different frame options, allowing you to find a perfect fit for your body type. 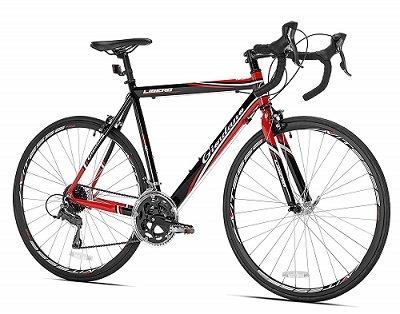 Vilano Aluminum Road Bike is a great beginner’s road bike. It is both lightweight and sturdy. It uses Shimano A050 shifters which are solid with smooth shifting. The Vilano is close to the lightest bike in its class and handles very well. The frame is made of double-butted aluminum and is available in 3 different sizes. The smaller size is 50 cm while the medium is a step up to 54 cm. If you need a larger frame, the 58 cm is available. The brakes are an alloy caliper type with the tires being 700c by 25c. The front forks are an inch and 1/8 without threads which help keep the bike stable and handling excellent. This is a surprisingly lovely looking bike with good quality paint. The wheelset is a 700c CNC double walled alloy machined which helps keep the weight limit down on the bike. The chain is made by KMC, which helps with smooth shifting and will last for several years. 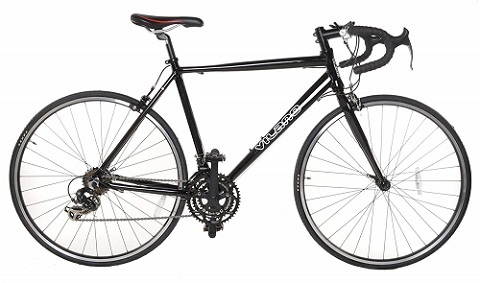 The Vilano is good for commuting in urban settings where the roads are not entirely up to par. The bike will take a good amount of punishment and still remain sturdy. Some of the bad features include the handlebar tape and poor quality tires. If you purchase a good set of after market tires and re-tape the handlebars, this bike should give you a quality ride for many years. 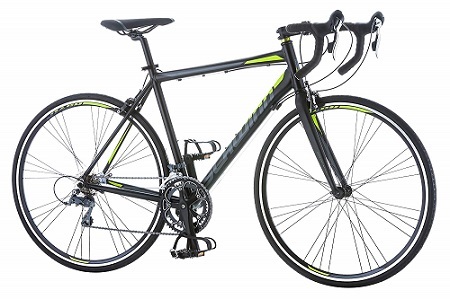 With the pricing under $300, this is one of the best cheap road bikes on the market. This is a road bike with both good and bad qualities. If you can work around the bad points, this still makes for a very nice bike. The Merax Finiss Aluminum is equipped with a thumb shifting 21-speed derailleur system that makes finding the right gear easily without removing your hands from the handlebars. The bike weighs in an approximately 28 pounds which makes it easy to handle for just about any rider. The bike is also implemented with a quick release front wheel which makes a tire repair a lot faster. This bike is capable of higher speeds due to the 29-inch rim size. One of the flaws in this is the pedals can hit the tires on a tight turn, which could cause loss of control. The pedals are also made from plastic which is easily breakable compared to other types of pedals. The brakes are aluminum caliper type which is not a very good system considering the speeds this bike is capable of. The handlebars are spaced very far apart making control a little difficult for a beginning biker. With all of this being said, this Finiss road bike is still a perfect bike for the money. It is made almost entirely of aluminum giving it a strength to absorb punishment while still being lightweight. It’s a very nice looking bike that is good for a beginner to start his riding experience before moving up to a more expensive model. The Libero is a very sturdy built bike with quality parts used throughout most areas. The only exception seems to be the tire quality, which can easily be upgraded. It uses a Shimano 16 speed drive train, which is enough gears for most situations. It does great in hilly areas and is fast enough on the level ground for just about anyone. Giordano saves bike weight by minimizing the number of gears, yet the bike is still quite capable for any road situation. The bike has alloy rims that are quick release with 32 spokes, which gives the wheels good strength. The shifters are made into the brake levers which might take getting used to for some people. The crank is more compact than on some bikes which make for easier hill climbing. The fork is made of high-tensile steel which helps with maneuvering at any speed. The brakes are a side pull caliper type which is one flaw of this otherwise good bike. Once you get used to the shifting lever placement, the Libero shifts smoothly up and down through the gears. There are 3 different frame sizes available on this bike, with additional weight added for each size increase. The smallest frame has a stand over approximately 30 inches. The medium increases to about 32 inches while the large is 35 inches. Except for the tires and braking system, this bike is a good ride for both beginners and professional riders. This is a good road that will need very little maintenance, due to the fact that there is no derailleur system to clog the chain up. It is also a lot more convenient to change a flat on the rear tire. It features a single speed fixed gearing or can be changed to freewheeling with the flick of a handle built into the rear hub. The fixed gearing means no coasting, any time the bike is moving, the crank is turning. When you are in the freewheeling mode, you will be able to coast. The Takara is a little heavier than most road bikes due to the fact it has a steel frame. The rims are made with a good alloy which helps keep the weight from becoming unmanageable for a lot of beginning riders. It uses side pull caliper brakes which take a longer time to stop than other types and need more maintenance. 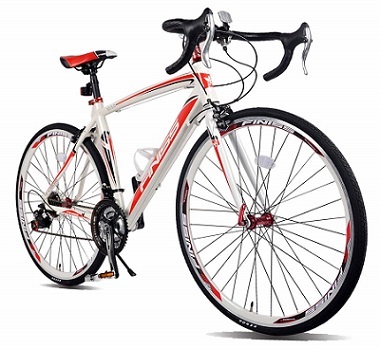 The bike is well designed for balance and looks great due to the bright colored tires with matching trim. This bike comes with 2 frame sizes, a 54cm and a larger 57cm. This is becoming a popular road bike for many due to its simplicity in the gearing. It might not be as quick as some of the multi-geared road bikes, but the smooth ride and lower maintenance make up for that. It has a great set of tires which helps the ride quality out. Uphill riding presents more of a challenge as well as long-distance commuting. 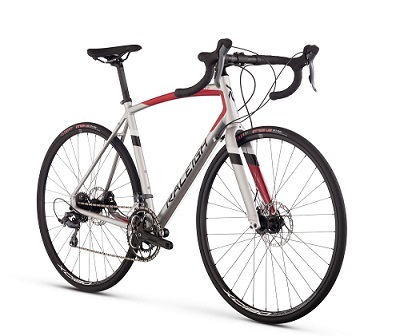 Overall, this is one of the cheap road bikes under 200. You can pay a lot more money for a good road bike, but this Schwinn shows that you don’t have to. This is a bike that gives you quality, strength, and durability at a low price. It has 16 speeds which are enough gearing for almost any situation. The frame is designed to create a comfortable ride which includes a soft padded seat. The aluminum frame keeps the weight low at 34 pounds. The addition of forks made of carbon fiber will absorb road bumps which help with the smooth ride. The shifters are integrated into the brake levers that are produced by MicroShift. The shifting through all the gears is fast and efficient. The Phocus comes to a fast stop at any speed thanks to the alloy caliper brakes made by ProMax. Stopping safely is essential for any road bike. The rims are made of a double wall high profile alloy with a paired spoke system that increases the strength of its wheels. The tires are large enough to hold the road good on the curves and straight-aways. The crank is efficient with 42 teeth on the smaller gear and 52 on the large one. The Phocus only comes with a 22-inch frame. The handlebars and seat though have enough adjustment to fit riders of different heights. Schwinn has been making bikes for almost 125 years and this model is a perfect example of the experience behind it. 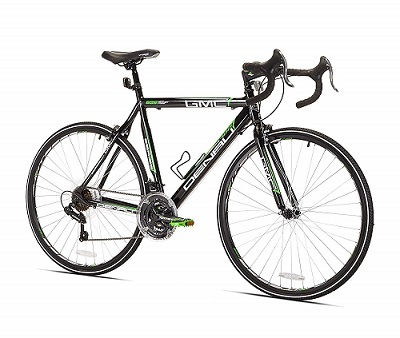 This is one of the best road bikes available at such a low price. 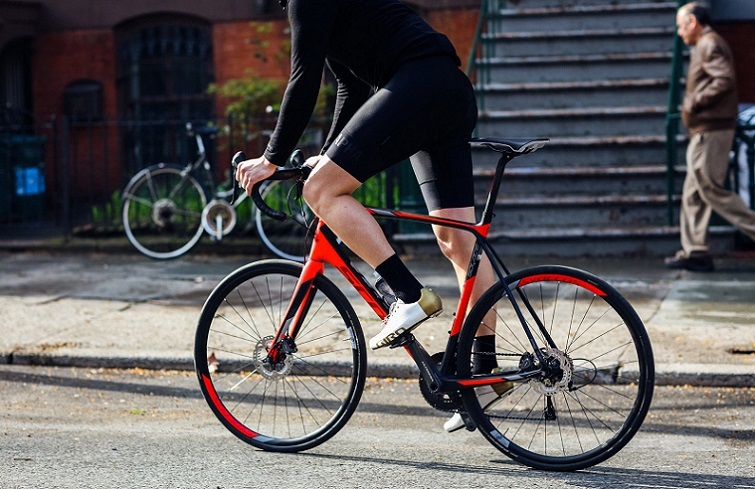 The Goplus is a good looking road bike featuring 21 speeds and a lightweight frame. This would be a good bike for a beginner entering road race competition or for everyday riding. It uses a thumb shifter that is efficient while going quickly through the gears. It has 700c high-performance tires which get a good grip on the road in most surfaces. There is only one frame size which is made for average height people. A tall person will feel uncomfortable on this bike. The front and rear derailleurs are from Shimano which smoothly moves the chain through the gears. Weighing in at just 32 pounds, the Commuter easily gets up to speed. The weight capacity is over 400 pounds which shows how sturdy it is built. The Goplus is available in 5 different colors with excellent looking trim accent. The quick release is available for the front wheel making maintenance a lot easier. The disadvantage of this is a possible loosening while you are riding which could result in loss of control. The pedals could become slick after being wet which could cause a foot to slip off. Braking can also be a problem since the bike uses a side pull caliper to stop the bike. The seat is adjustable but still somewhat uncomfortable. Even with these little issues, it is still one of the best cheap road bikes around. This bike should last for several years as long as it is properly maintained. This is a great starter bike for someone just getting into riding. The price is under $200 and it gets you decent 21-speed road bike. It’s available in 4 different frame sizes so finding a good fitting bike is much easier. The drop-bar type handlebars are not adjustable so the riding position is harder to be comfortable with. The weight is approximately 30 pounds, depending on which size frame you chose. The frame and fork are both made of aluminum which helps absorb road shock. The Denali uses a Shimano rear derailleur and Revo shifters which work pretty decent. The shifters are mounted on the handlebars for easy access. The tires are 700c mounted on Vitesse high profile racing rims. They do great gripping the road at any speed. These types of tires have become very common on road bikes, so finding replacement tubes and tires have become quite easy. It comes with a Vitesse padded seat which is designed for comfort and long rides. A water bottle holder is standard equipment and is easily reachable. This bike is a good deal for the money. You wind a with a decent road bike that has good speed and handling. It is a comfortable bike ride that you can spend several hours on. The Denali is a good choice for riding to work, school or just cruising around. With 21 speeds to chose from, most types of terrain will be easily conquered. Raleigh has done a great job at making this one of the best road bikes for the money. It is sleek and fast. The frame and fork are aluminum which is flexible enough to help absorb road bumps. Using 700 by 28c tires also helps with ride quality and handling. It weighs in under 25 pounds so getting this bike up to speed is very easy. 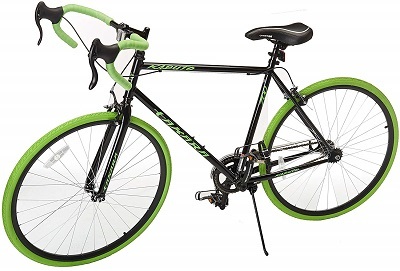 The Merit has a 16-speed system which shifts easily and the gearing is very effective. Hills will be easy to overcome for just about any rider. This road bike is good for going the distance. Long commutes on this bike are enjoyable and comfortable. The axles are designed to help reduce fatigue and increase handling capabilities. This is a road bike that you can ride through the city or across the state. The Merit 2 is definitely built for endurance. The derailleurs and shifters are both made by Shimano Claris. These are both of high quality with the shifters in easy reach. The wheels are a Weinmann double wall XC180 model which are strong and capable for long distance riding. While using a TRP Spyre C type of mechanical disc brake, you are guaranteed a quick and safe stop. The Merit 2 has a lifetime limited warranty on the frame. This is an awesome road bike that will last for many years if taken care of properly. The XC550 is a good bike for entry into road biking. It looks good while moving or sitting still. It has a sturdy steel frame which will absorb a lot of punishment. The front derailleur is a Shimano TZ30 which moves the chain up and down on the crank sprockets smoothly. The derailleur on the rear is a Shimano TZ50, which also shifts well. With a total of 21 speeds, the Eurobike is designed to flatten out hills with great speed on level ground. With the speed available on this bike, stopping is an important factor. The XC550 has disc brakes on both front and rear. This is a great safety feature, especially for beginning riders. The bike balances in at a little over 30 pounds with a weight capacity of 330. The seat is fairly comfortable and the handlebars are well taped which helps out on long rides. There are 2 different frame sizes available for riders to choose from. The Eurobike XC550 is available for under $200, making it an excellent purchase for someone interested in getting into biking. This is an excellent ride for students and for those who want a healthier way to commute to work. Some parts on this bike can be upgraded to compliment an already excellent bike. The paint and trim detail looks decent and with proper maintenance, this bike will put on many thousands of miles. Buying your first road bike takes some consideration. You need to know what purpose the bike is going to be used for. There are differences between racing and endurance models. 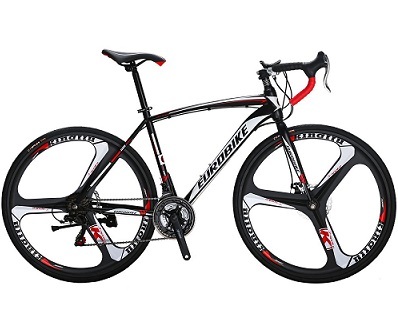 If you plan on getting a bike for everyday riding, the endurance type is the way to go. A bike made for racing has a more aggressive frame design which puts a rider down lower in a better aerodynamic riding position for less wind resistance and quicker handling. The gears are larger which will require a lot more effort to get the bike going. It also means you will be able to go faster once you get up to speed. This type of bike is made more for an everyday rider that commutes to school or work. They are also good for long distance riding since they are more comfortable to ride. This kind of bike will put the rider more upright and the frame is more focused on comfort and stability. Picking the frame for your bike will depend on the type of riding you will do and your budget. A steel frame will be the heaviest with a tendency to rust if exposed to the elements. It is a good choice for longer distance riding since it is more comfortable on the road. An aluminum or mixed alloy is lighter which makes for easier handling and more speed. Moving up to titanium or carbon fiber will make the bike almost feather light but the cost is extraordinary high. These materials are mostly reserved for true race bikes. This is the gearing on the rear wheel and crank. The more gears you have on a bike will increase the chance of finding a perfect gear for the riding situation. This doesn’t necessarily mean more speed though. This depends on how large the gears are and the ratio between the front and rear gearing. Most road bikes are available between 10 and 30 speeds, but the more gears added will also increase the bike weight. Electronic shifting is starting to become available on some of the upper-grade bikes, ensuring a better shift with less chance of derailing. The type of wheel you get on a road bike will determine how much rolling resistance you have on your bike. Look for better wheel bearings, strong lightweight spokes, and deep profile rims. This will translate into a smoother rolling ride with less pedaling to get you to your destination. It also means you will be capable of higher speeds with less effort. The bottom line is to know what you will be using your bike for and how much you have to spend. Shopping around will also get you a better price since the same bike could be priced less at a different location. Test ride different bikes if possible to see what you like best. Your satisfaction is what counts when choosing a bike. When shopping around for a road bike, there are several things on a bike that needs to be checked before deciding on purchasing it. Taking a bike home only to find flaws in it later can ruin your road biking adventure. This can keep you from enjoying the excitement of everyday bike riding. Having a comfortable ride starts with the seat. If you can’t ride for several hours without the seat bothering you, you should look at a different bike. If you really like the bike, you could also consider upgrading to a seat that is more to your liking. Take the time to find a bike seat you are comfortable with. The bike needs to be adjusted to the frame of your body style. You should be able to adequately reach the ground with the bike at a standstill. The handlebars should be adjusted for a good fit to keep from getting pain in the back, shoulders, and wrists. The seat should be level to keep from sliding forward or backward while you are riding. You should be able to pedal smoothly without stretching your legs. The brake should bring the bike to a quick controlled stop no matter what your speed is. There should be no rubbing of the pads or discs on the wheel or other parts. The brake levers should be in reach and easy to apply. Braking is one of the most important safety features on a bike so they should be tested every time you ride. The wheels should be checked for quality and spin. There should not be any wobble of drag in it. The bearings shouldn’t make any noise or keep the wheel from spinning properly. The spokes should all be tight without being bent. There should also be none missing or broken. Good wheel quality is a must for any type of bike. The gears should not have any worn or missing teeth. The derailleur should be adjusted where the shifting through the gears is smooth without any problems. The chain should not come off at the top or bottom of the gears. The chain should be free of kinks without any broken links. The crank should not have any wobble or drag in it. The bearings shouldn’t make any type of grinding or clicking noises. It should turn smoothly without any problems. The pedals should have a toe clip installed to keep the feet from slipping. The welds on the frame should not have any cracks in them. Having a frame break while riding is very dangerous. The handlebars should be tight and straight. The bike should be inspected before every ride looking for potential problems. This includes loose nuts and bolts, braking, and pedals. A pedal coming off while riding can also cause problems. Buying an entry level road bike will help you stay in shape and keep you healthier. If you are a new rider or have been away from biking for a while, you need to start out slow. It will take a little more time to get used to riding as you will be using muscles that haven’t had this kind of strain on them. Staying safe is another important part of biking. Drivers have a harder time seeing bikes due to obstruction of their vision in a vehicle. Always wear a bike helmet and install a good lighting system for night riding.